New Energy Efficient DC Cooling Fan Series From NMB - With a single phase motor technology designed for low power consumption, the new RL Series of DC cooling fans from NMB are designed for the server, telecommunication, medical, office automation and power systems industries. NMB Technologies Corporation, a Minebea Group Company, announced today the availability of a new series of energy efficient, low noise, high pressure DC Axial cooling fans. Designed with a single phase motor technology for low power consumption, and a new innovative casing with integral stationary blade, the new RL Series from NMB provides increased efficiency as well as improved air flow. 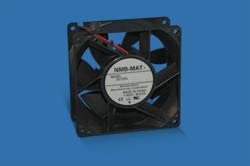 "NMB is expanding our very popular DC Axial Fan product line. The new RL Series features a host of standard and custom characteristics that complement our current pg=2 [DC fan __title__ DC Axial Fan Listing] product line," said Fernando Palarca, fan product manager for NMB Technologies Corporation.